JTSV Tiago JTP came home this Saturday! Were there more delivered along with yours'? Any idea what sort of demand this pocket rocket is seeing in Pune? Last edited by SoumenD : 14th January 2019 at 11:28. Congratulations on the red hot Jtp! It's interesting news that it's sold as JTSV Tiago and not under the Tata PV stable. Maybe the differentiation as a seperate entity helps in contractual obligations , profit sharing etc. P.S: This isn't Tata Tiago JTP but JTSV Tiago JTP. JTSV is a separate entity which is modifying and selling these cars. Even the owner's manual has no mention of Tata anywhere. This is also the reason registration is getting delayed because JTSV is not registered at manufacturer at RTO. I feel they should have also done something to the logo to differentiate (Like Honda R Type). In fact going with a new brand identity altogether also would have been worth considering! Planning to do same. Will get better pictures to populate the detailed post. 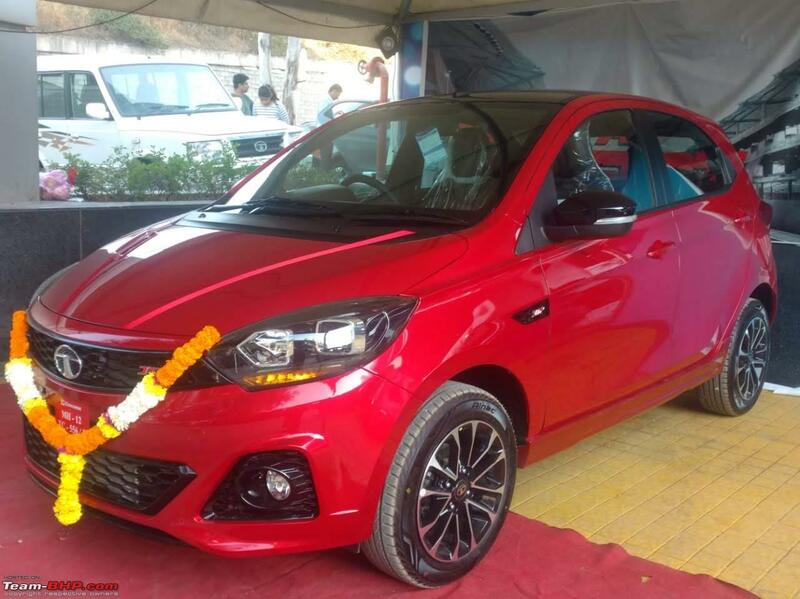 There is one additional Tiago JTP and one Tigor JTP to be delivered in Pune from what I know. There is some initial demand from those who were specifically waiting for them. However, I don't these will see sustained demand. Anyways Tata has limited them in terms of availability so that will be a factor as well. Yes, a Red Tata logo would have been great but I think this subtle differentiation and JTP logo looks classy as well. The brand identity is actually completely different. This is JTSV car and not Tata car on paper. All my points of contact are JTSV employees and not Tata employees. In fact, these JTPs can only be serviced at 30-odd designated showrooms who are called JTSV authorised service centers. May be Tata will make JTP branding louder than Tata if things pick up. Till then, JTP will ride on the newfound success of Tata. Last edited by ksameer1234 : 14th January 2019 at 14:02. JTSV Tiago JTP came home this Saturday! Have only driven from showroom to home so can't write any meaningful impression as yet. There is a lot of driving coming up over next few weekends which will help in gathering initial impressions. Congratulations for your new acquisition. I think its the first JTP in Team-BHP. Wish you many happy miles with 114 horses. Eagerly waiting for more photographs and your ownership review. Congrats on the new wheels. Waiting for my copy eagerly, should be here under 2 weeks. Do keep us posted on your experience. Being in Pune,i can imagine how enthusiastic JTP guys would be, talking to them on the phone I could make out that they aren't only thinking of selling the product, but want to get you involved in the experience of driving. Hey man - you own a rabid raccoon RC390 which is knows for its madness now this! All the best and happy revving 114 horses - Jockey!! Congratulations on the acquisition of JTSV Tiago JTP. Enjoy the car to the fullest which I believe you will. Note: you just made a dead thread alive. Meanwhile the new Ertiga thread is very crowded round the clock. It shows the real preferences among the ‘enthusiats’. Tiago JTP looks stunning in Red. Contemplating picking one once it is released. I have a 2004 Indica V2 LSI (~1400 CC MPFI), it still puts a wide grin on my face whenever i drive it, the low end (right) torque from that engine is addictive and the mid-range is awesome, the same in absent in the my 2014 Manza Q-jet and also missing on my 2018 Bolt Revotron. I am hoping i will be able to experience the same (or more) kind of pull from the Tiago JTP, the midrange and inital torque i mean. My Indica had a sweet spot between ~70kmph, i know its not that fast, but the engine and exhaust notes at that speed were sweet and just tapping the accelerator from there on and going past 100 was the best part for me with that car. Great news! Hoping that you get your hand on one at the earliest! Yes, this is really refreshing. JTP team does not come with any baggage of past and they understand what an enthusiast feels. The passion with which they have made these cars shows in the interactions. Thanks! Every morning I see the parked car and I just stand there for a moment admiring the beauty! My RC390 stills evokes same excitement in the parking four years later and I am sure it will be same with JTP. Thanks! I make decisions from heart and fill my garage with powerhouses whereas in reality, I am a sedate driver/rider! JTP is something special and I am sure Tata guys were not expecting it to set charts on fire. These cars are an honest and passionate attempt but in the end, Tiago is an entry level car for families on budget. The perception of performance is not there in masses and JTP is currently more of a brand building exercise. But Tata has made a confident start and there is certainly a commitment to this cause. I am hoping i will be able to experience the same (or more) kind of pull from the Tiago JTP, the midrange and inital torque i mean. I'll suggest you take multiple and extensive test-drives for JTP because from my very short run of about 15kms, I did not find the low-end torque to be significantly better than Tiago. Midrange is good but then I did not cross 3000 rpm. I have Zest RT in family which I have driven extensively and that engine is no slouch compared to this. In fact, that engine is far more refined. Also, Zest only lacks the top-end which is totally empty. I guess JTP will be better but I am yet to find out first-hand. I got a message from Concorde, Guindy that they have a Tigor JTP for TDs. They had a Tigor for display too. It's been a week or two since I got the message, was traveling and hence couldn't try the vehicle. May be this weekend! The original list that Tata had mentioned for dealership for JTP cars only included Gurudev motors Koyambedu. So I was thinking that only one dealer had JTP cars in Chennai. It is a good news that there is one more dealer. As for now, I only have this customary pic. Will piece together better pictures and start drafting the ownership experience! Congratulations!! Have a Happy, safe and spirited driving! Do let us see more pics of the car and a review about your impressions. One quick question: Does it have auto retractable OVRM or manually needs to be folded ? I recently had a test drive of the TIAGO JTP and must say it was an awesome experience, never expected a TATA car to blow me away in terms of driving experience. I must admit this was the first TATA car I asked for a Test drive with lot of curiosity and enthusiasm. Sharing my experience of the Test drive of Tiago JTP I had recently. I currently own a 2007 Baleno 1.6 and you can know what expectations we usually have after driving around the Baleno for 5+ years. I had lot of expectations. I had already taken an extensive test drive of the Baleno RS and was impressed by it already. I had already made up my mind to buy the Baleno RS over the regular Baleno and for lack of options as investment cost and service upkeep were both a priority for me. Apart from Baleno RS, I had considered the below cars. Punto Abarth though considered but was taken off the list as the same wasn’t selling anymore and the scary after sales service of the car. Ford Freestyle was on the list too but at the same time, since it doesn't look much different, and I wasn't convinced to put my money on that car for my own reasons, dropped it. Polo GT TSI is a good driver's car with most bells and whistles but VW service experience scared me and I am not willing to shell out 11L+ on a hatch which doesn’t have backseat comfort as even that is important for me. I am looking for a Hatch for my daily commute of around 50 kms in the city and may be weekend drive of about 20-30 kms incase. After initial research on the net including this review, I was very curious to take a test drive of Both TIAGO JTP and TIGOR JTP for obvious reasons. Tigor JTP wasn’t available for Test drive last week, but Tiago JTP came right infront of my door. I told the sales person, that I would be taking an extensive test drive of the car and hence took a good two hours of drive including both City and Highway. Expecting the Tigor JTP for test drive this weekend, let’s see. 1. TIAGO JTP is definitely a looker and I just loved the meaty look of this hot hatch, the Red with Black is an awesome combination, though I would love the White with Black lot more as Red doesn’t age well whereas White though aged will still look good in the long run. 2. Seats are supremely comfortable, good side bolstering and holds you in the seat. I would give full marks for the comfort. 3. Back seat comfort, I had two people who were almost 6ft in height and were comfortably seated with just sufficient head room and leg room. 4. Engine and exhaust note, though It’s heard quite a bit in the cabin, you won’t get annoyed however, if you are constantly driving in high speeds, the thrum may irritate some who don’t like cabin noise and the NVH is on the higher side. As an enthusiast, I liked what I heard. One will love the turbo spool when A is released in between. 5. Ride quality is Superb just as TATAs are known for. Tiago JTP is definitely an enthusiasts’ first choice on a budget. 6. Ground Clearance, though lower by 5mm it actually doesn’t make much difference. It handles rough roads with ease and the cabin didn’t let any undulations on the road felt inside with four adults on board. 7. Steering feedback is very good and precise. Tiago is definitely a very good car for city drive and very chuckable. 8. Handling and Road Grip is its forte and what an awesome one at that for a hatch. Baleno RS and Polo GT TSI can definitely take some queues from JTPs in terms of suspension tuning and handling and what exactly is a Performance Hatch. The car feels planted at high speeds, no body roll as such, it takes a lot to unnerve the car. Though I am yet to have a drive as one in the ghats or twisty curves. I am sure people will swap the tyres 195 section ones if they really want to push the car further for handling but that might slow down things a bit more. 9. Pricing – Bang on, compared to Baleno RS, It’s 2.5L cheaper and definitely offers much more in terms of experience other than features and goodies. 10. Air Conditioner though manual was really good in terms of cooling effect and we never felt the need of increasing the speed beyond level 1, I was surprised. 11. Build Quality, any one coming from Maruti’s would know, that the Build quality of Tata cars are really good, compared to Maruti’s. Though each manufacturer does have their own reasons for making their cars heavier of lighter. But I feel MS should really consider making their cars more rigid and heavy in terms of build quality. The real problem are the fuel economy obsessed crowd to whom MS is catering to and is really good at that. I wouldn’t blame the manufacturer, just like the Govt will be as the People are, Cars will be as the Consumers are. 12. Braklng, I was reluctant to drive the car fast seeing that there are no all round disc brakes after having a very good experience in Baleno RS with all disc brakes. The brakes on RS is super sharp and definitely confidence inspiring. But I was wrong, the brakes are really good and effective though it’s the regular Disc(front) and drum at rear. It’s livable. 13. Cabin Feel – I felt the all black cabin is really good and the minimalist design, one would have all the necessary features that are usable and required. Though there could have been a better infotainment system not that I am complaining about what it offers, just that It could have been better. 1. A good engine but it’s not rev happy, four cylinder engines will be missed if driven for long time. 3. In third gear, the limiter cuts in beyond 5500rpm as well and we can’t push the car further as we know per this review too. 4. 4 & 5th gear are good for maintaining triple digit speeds, but as a Hatch with 4 adults I could see that the car doesn’t reach the speed limit as set by JTP easily. It takes some effort for someone to even reach closer to the speed limit. Any loss in power or traction, you will have to shift to 3rd to pick up again. 4th & 5th are good only after you have gained speed. 5. The power delivery in bumper to bumper traffic is jerky, once you know how to avoid the lag, guess it’s an easy fix and just needs getting used to. 6. The Tail lights could have been bit more different and looks very simple per my view. 7. Top speed fun is not easily achievable as in Baleno RS though being a short throw gearbox and one litre engine. The refinement levels are really good in RS. This is where RS scores over the JTPs but handling is where RS loses out to JTP. 8. The Gear shifts could have been better, specially you will miss shifting to third gear once you have picked up speed in second. Guess this might need some getting used to. Gear shifts did miss sometimes though consciously driven. 9. Steering position will not be liked by people who are tall like above 5’9 as there is no telescopic adjustment and the steering rack is quite on the higher side. Not that I am complaining, it is good enough only thing is you need bit of time getting used to. 10. A lower seating position would have added to the drive feel. Overall, I feel proud that we have a homegrown Brand which has created tastefully doneup Performance cars which mean Performance in the real sense and not just a sticker job, which has all functional bits serving the purpose and creating a benchmark. MS specially take note. You have competition now. Hoping these JTPs sell well and remain a chapter which started things in a new perspective. My money is on JTP for now. I didn’t expect this write up to be this long, when I was penning it, I don’t write often. But I felt it’s good to share as I will get to hear from so many BHPians sharing their knowledge and expertise here. I am a not an expert. Thanks for your patience to read through and let me know your thoughts. The Dealership list for JTPs seems to have been expanded. There were only 2 dealers in Kerala in the first list, but now there are 4! But sadly, none in Trivandrum yet. I will have to go 220kms for a Test Drive or will they bring it all the way from Cochin/ Ernakulam to Trivandrum, which is 220kms away?